So, I've had this stack of 3x5 index cards for some time with no real use for them. 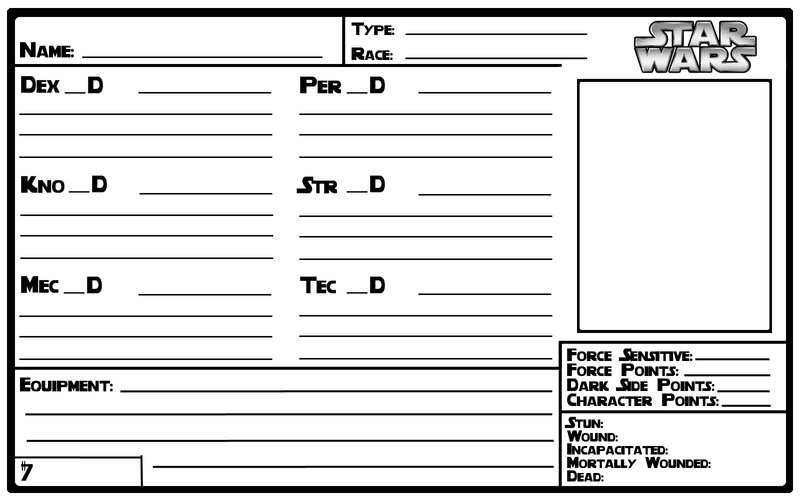 Now that I'm running SWD6 again, I came up with an idea: quick-reference NPC sheets. 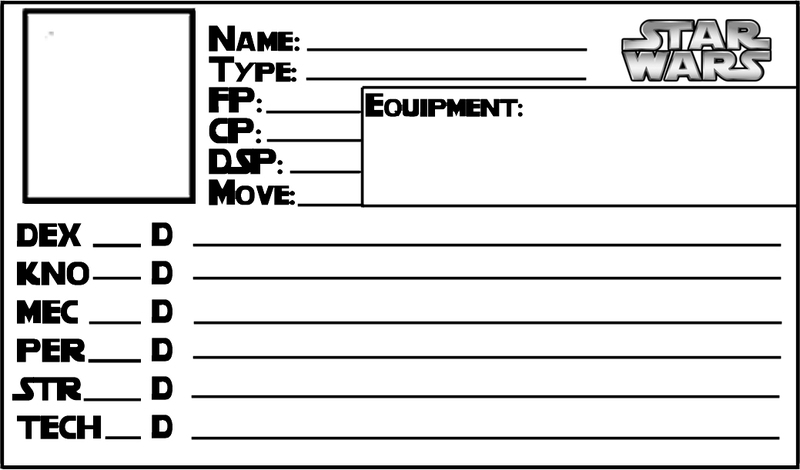 Instead of having a stack of character sheets or a list of stat blocks, I've come up with a printable template that can go on a 3x5 index card. Here's one that I just filled in. I'm planning to make up some 5x8 variants after I get ahold of some 5x8 index cards. "Don't you have to have mini-clorinies in your blood or something to be a jedi?" "Oh no, that's just something we used to tell people." Let me make you a picture! And here are the 5x8 cards. They're a bit more useful if you have a recurring villian but don't want to take up much of your GM space with full-size character sheets. EDIT: I forgot to include a space for Special Abilities. Here's the fix. Location: Farthest from the bright center of the universe. I'll see if I can figure out how to do that. I think I prefer these over the 3x5's. Of course, that makes them roughly the same area as a regular template, just with different dimensions. 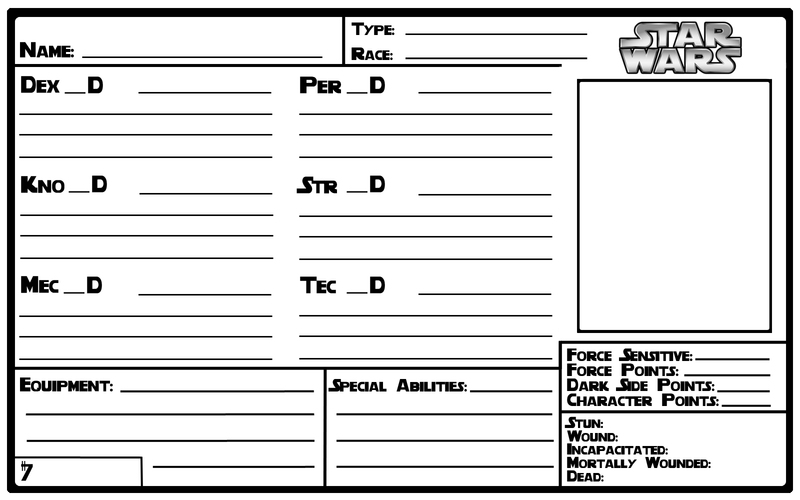 My GM when I used to play D&D3.5 used these, but there was no possible to way to fit all that character info on a 3x5. With WEG D6 characters, it looks like it would work. Personally I keep everything on my notebook. XLS file with all NPCs, tables, music, graphics to show. We only use pen and pencil for drawing a map during an encounter. I use the 3x5's for "filler" characters, like thugs and the like. Hence the lack of damage trackers. For major recurring NPC's, I use the 5x8's. Are these available in a pdf anywhere on the site? 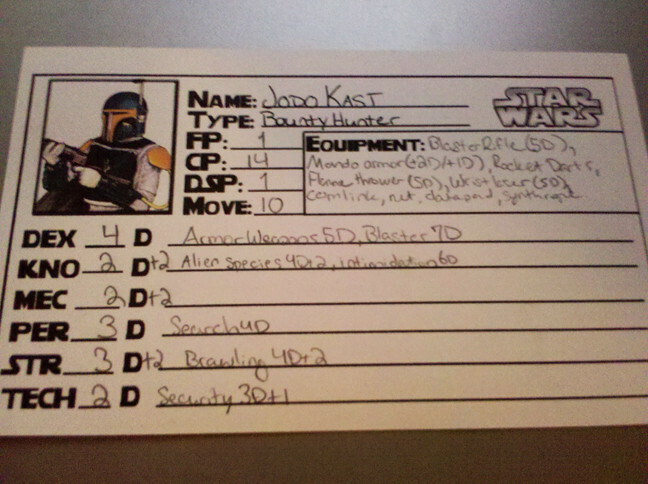 I've used 3x5 cards for minor characters: mooks, thugs, and spear carriers. I've handwritten the cards in the past, which allows me to use the card out to the edges. I'd like to print them out, but I don't know how to use all the space. For main characters I use an MS-Word template so that I can type in the info, store electronically, and then print as needed. Since I never was able to locate fillable versions of these cards I made versions of my own. Which you can download from here. Thanks for sharing these, Edsel! This is a great idea. Even just jotting them down by hand on index cards wouldn't take long at all. The man who thinks he knows everything is most annoying for those of us that do.